Hi! I’m Lisa Hilt, a Monitoring, Evaluation, and Learning Advisor for Policy and Campaigns at Oxfam. We strive for policy changes that will right the wrongs of poverty, hunger, and injustice. Much of our progress takes place in small steps forward, resulting from ongoing engagement with key stakeholders and multiple campaign spikes (high intensity, short-term advocacy moments focused on a particular issue). Were the outcomes worth the resources we invested? How can we be more effective and efficient? We evaluators ask: How can we support teams to answer these questions with confidence when in-depth analyses are not possible or appropriate? 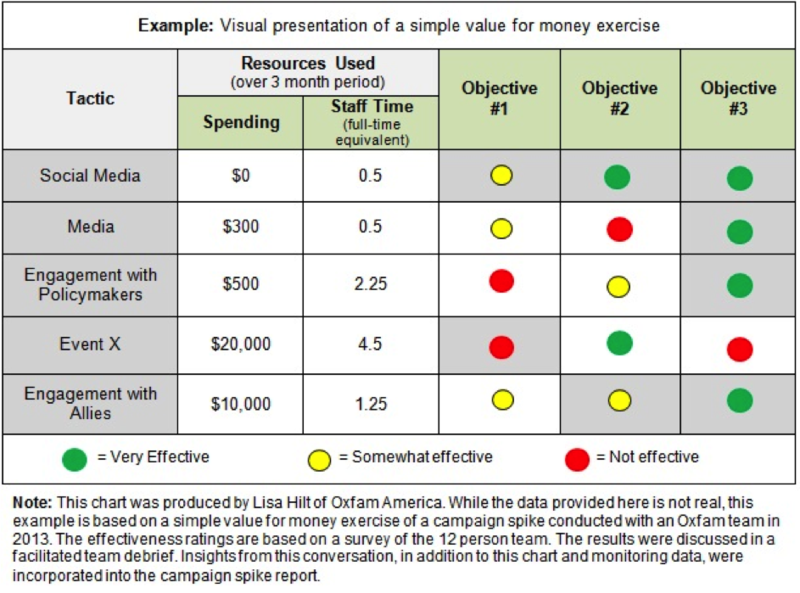 We’ve found from our experience at Oxfam that conducting “simple” value for money analyses for campaign spikes is a useful alternative for the teams we support. Plan ahead: Even simple analysis can be difficult (or impossible) to conduct without pre-planning. Decide in the planning phases of the campaign spike which indicators and investments will be tracked and how. Break down investments by tactic: Having even a high level breakdown of spending and staff time by key tactics (see example) enables more nuanced analysis of the connections between particular investments and the intended outcomes. Team analysis is key: In addition to using “hard” data as a source of evidence, utilize insights of team members who bring multiple perspectives and are experts in their field to assess the extent to which their interrelated efforts relate to the results. Team debriefs are an effective way to do this. Present information visually: A visual presentation of investments and outcomes enhances the team’s ability to make sense of the information and generate actionable insights (see example). Indicate which tactics were intended to achieve specific objectives. Don’t let perfection be the enemy of the good: Slightly imperfect analysis is better than no analysis at all, and often adequate for short-term campaign spikes. Match the levels of rigor and effort to the confidence level needed to enable the team to generate reliable insights. Trust is important: Trust and communication is fundamental to honest conversations within the team. Be cognizant of team dynamics when designing team reviews, and focus the discussion on the outcomes and tactics, not individual performance. Focus on the future: The strategic learning and forward-looking aspects of this type of exercise are arguably the most important. While looking back at the campaign spike, focus the conversation on what the team can learn from this experience to improve future efforts. Thanks For Share This About Money analyses in policy. Hello, My name is Christian Ortiz and I’m currently an undergraduate student at Texas A & M- Central Texas. The steps that you outline to break down your investments into tactics is super user friendly. It’s application usage in evaluation preparation makes it simple to see what you can realistically do or not do. Thanks for the information. Although this blog was about policy changes to right the wrongs of poverty, hunger and injustice, it also put forward some really great ideas that can be universally applied to any program evaluation. Preplanning how funds for the project are disseminated is key to monitoring, measuring and analyzing the evaluation team. A meaningful lesson learned is to choose a visual presentation of the data which enhances the team’s ability to interpret the information. Trust and communication is an important element of the team dynamic.